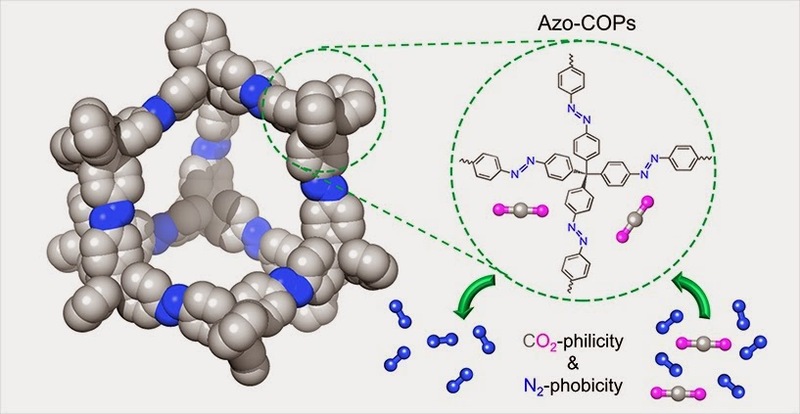 A family of azo-bridged covalent organic polymers (azo-COPs) was synthesized through a catalyst-free direct coupling of aromatic nitro and amine compounds under basic conditions. The azo-COPs formed 3D nanoporous networks and exhibited surface areas up to 729.6 m2 g−1, with a CO2-uptake capacity as high as 2.55 mmol g−1 at 273 K and 1 bar. Azo-COPs showed remarkable CO2/N2 selectivities (95.6–165.2) at 298 K and 1 bar. Unlike any other porous material, CO2/N2 selectivities of azo-COPs increase with rising temperature. It was found that azo-COPs show less than expected affinity towards N2 gas, thus making the framework “N2-phobic”, in relative terms. Our theoretical simulations indicate that the origin of this unusual behavior is associated with the larger entropic loss of N2 gas molecules upon their interaction with azo-groups. The effect of fused aromatic rings on the CO2/N2 selectivity in azo-COPs is also demonstrated. Increasing the π-surface area resulted in an increase in the CO2-philic nature of the framework, thus allowing us to reach a CO2/N2 selectivity value of 307.7 at 323 K and 1 bar, which is the highest value reported to date. Hence, it is possible to combine the concepts of “CO2-philicity” and “N2-phobicity” for efficient CO2 capture and separation. Isosteric heats of CO2 adsorption for azo-COPs range from 24.8–32.1 kJ mol−1 at ambient pressure. Azo-COPs are stable up to 350 °C in air and boiling water for a week. A promising cis/trans isomerization of azo-COPs for switchable porosity is also demonstrated, making way for a gated CO2 uptake.